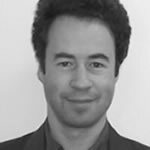 Olivier Fournout (PhD Paris IV-Celsa) is a researcher at the Interdisciplinary Institute for Innovation (I3, a joint research CNRS unit) and an Assistant Professor in the Social and Economics Department of Telecom Paristech. He is the author of the book « Héros. Action, Innovation, Interaction dans les organisations et au cinema », Presses des Mines, 2014. His presentation will focus on the Hero-Leader Matrix in business and cinema. It will be based upon his research into how successful managers and cinema heroes operate in their actions and interactions, which shows a structural consistency between the two fields in the long run.